Minister Regev to the Attorney General: Prevent visits by MKs to security prisoners, unless their belongings and bodies are searched. 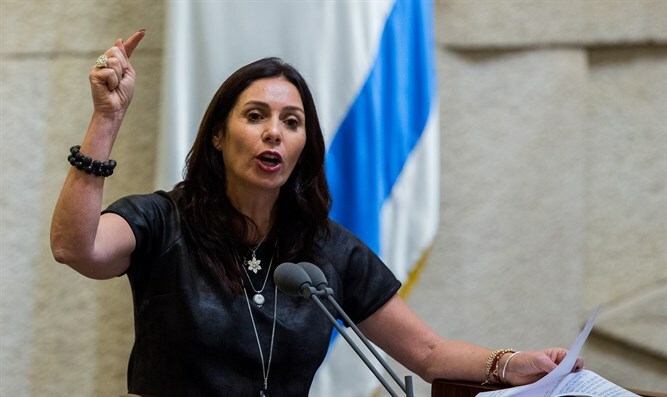 Minister of Sport and Culture, Miri Regev (Likud), sent a letter to Attorney General Dr. Avichai Mandelblit on Monday, following reports in the media that MK Basel Ghattas (Joint List) smuggled mobile phones to security prisoners while visiting them. The minister asked the Attorney General "to instruct the relevant officials and managers of the prisons to act in accordance with their powers under Article 30 (b) of the Prisons Regulations, according to which: ‘The prison warden may prohibit, by a reasoned decision in writing, the advent of a jail visit, establish limiting conditions or terminate a visit or a meeting with the prisoner, if he has reasonable grounds to suspect that the visit will damage state security, public safety or the order and discipline of the prison.’ They should prevent visits to security prisoners by MKs in general and by MK Ghattas in particular. But if they do allow such visits, their belongings and their bodies should be searched." Public Security Minister Gilad Erdan said on Channel 2 on Monday evening that police have not been able to find MK Ghattas or any of his assistants and that he apparently went underground. Erdan said that he will work to change the law so that MKs cannot visit security prisoners convicted of murder. The police have alerted all border crossings to prevent MK Ghattas from fleeing the country. A spokesman for MK Ghattas, lawyer Khaled Titi, denied that he went into hiding and said that "MK Ghattas will come forward, and we are in contact with the police." Yesh Atid party chairman Yair Lapid said that if MK Ghattas did smuggle the cell phones to the security prisoners, he is a miserable traitor and should sit in prison. Lapid also said that he asked the Attorney General to immediately remove Ghattas’ immunity as an MK.